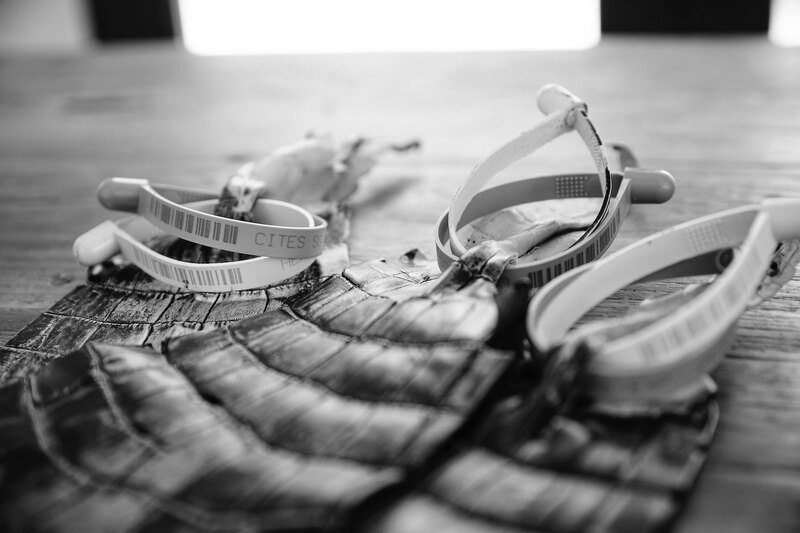 METTIQUE is a luxury lifestyle brand dedicated to high quality crafted leather accessories. At METTIQUE, we do not believe in the need for obtrusive or exaggerated advertising. Rather, we are happiest to let our products speak for themselves. 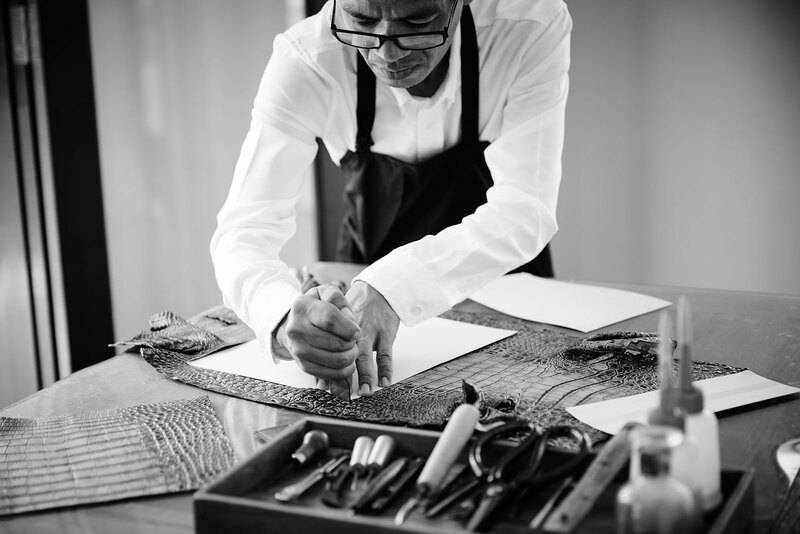 METTIQUE strives for excellence through the selection of the best possible raw materials, stringent craftsmanship standards, refreshing designs, and meticulous quality control-to ensure that customers receive the most well-crafted products available. Because developing even a single product model takes up to several months, and producing a single piece just over a couple of weeks, we are of the opinion that you should not feel the need to change your bag or accessory every season. We would prefer instead that you keep it for a lifetime, and pass it down to your loved ones. This is what quality means to us. This is what timelessness means to us. 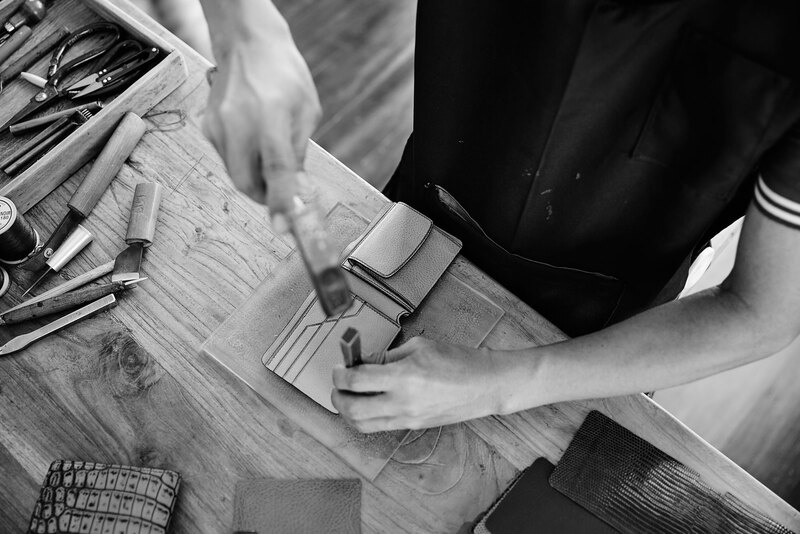 Please allow us to share with you our philosophy for making the best possible leather goods. As many luxury products are beginning to substitute craftsmanship with machines, we at METTIQUE pledge to conserve the craftsmanship tradition. 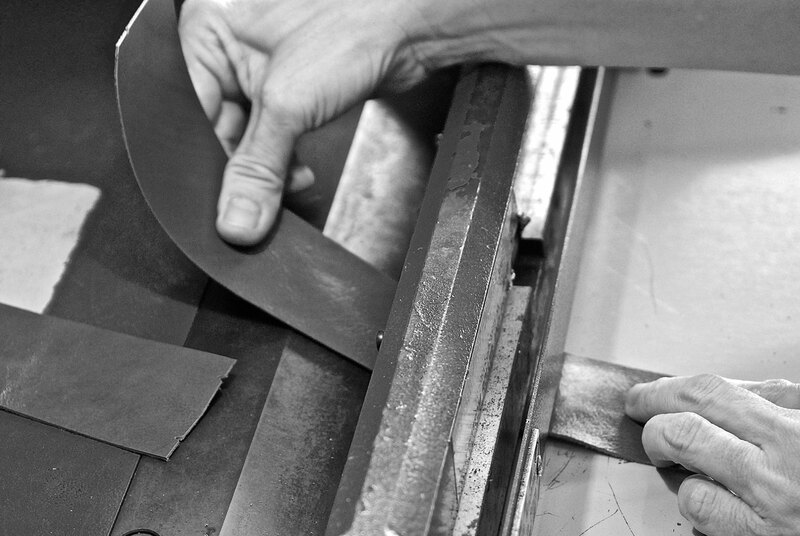 All of the steps conducted at METTIQUE atelier are 100% hand-made. This is to not only render each piece of work one-of-a-kind but also to achieve durability and that hand-made charisma that machine-made products can never achieve. We want our customers to know that the exotic skins we source do not and never will come from endangered species. Our exotic skins, such as python, crocodile, and alligator, are all “CITES” certified: every single step in their procurement complies with the international regulations set by the Convention of International Trade in Endangered Species of Wild Fauna and Flora (CITES). Those skins that do not legally require CITES certification, such as the South-African ostrich skins, all bear certificates of origin, tracing back in each case to the particular specimen’s country of origin. Getting skins without defects starts in the farm as you have to make sure that the animals are bred with care and this requires greater amount of work. Regardless of the effort, we at METTIQUE refuse without the slightest compromise to use scarred leather. Therefore when possible, we source only exotic skins of grade 1 standard, bearing none of the defects present on skins of grades 2, 3 or 4 standards. 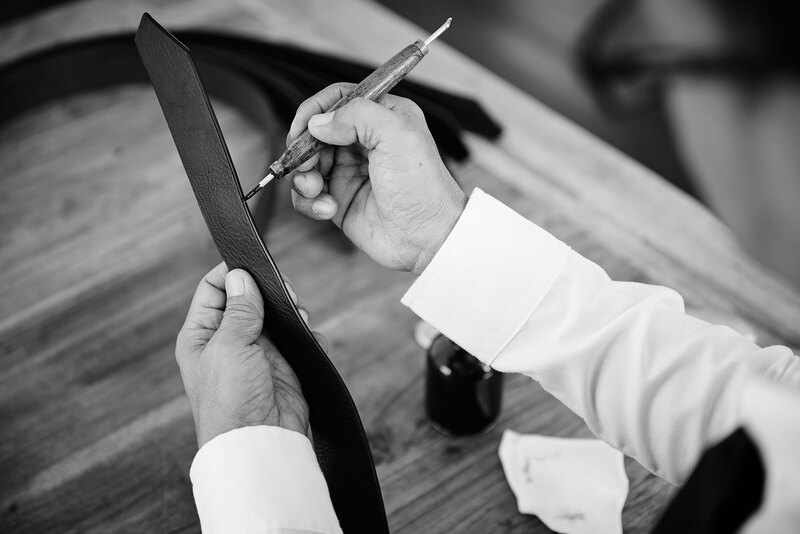 METTIQUE settles in all instances for nothing less than the finest quality leather. For instance, we use only real-grained leather and we believe that natural beauty can only come from natural materials. When it comes to cowhide leather, we use real-grained Italian vegetable-tanned cowhide leather with our products. When called for, we tan the cowhide leather ourselves, at our tannery, using a centuries-old artisanal tanning technique. This tanning technique is extremely difficult to carry out correctly and we are one of only a handful of ateliers in the country with a tannery employing this technique. Leather that we do not tan ourselves has, without exception, been carefully selected, and is sourced from distinguished tanneries around the globe. This ensures that our fastidious standards are always met. 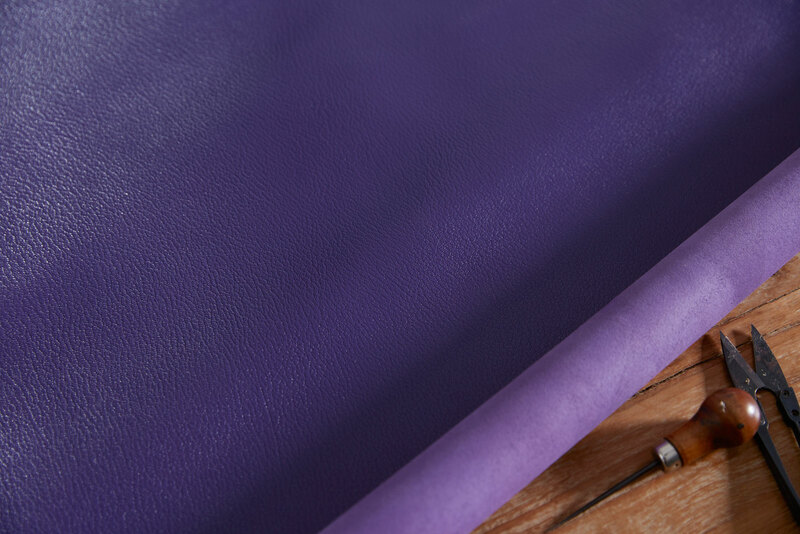 Our products’ internal structures and linings are made of leather only. Fabrics, cardboard, plastics, and other synthetic materials are avoided for one simple reason: their life cycles are shorter than that of leather. They will quickly unglue and fall apart. 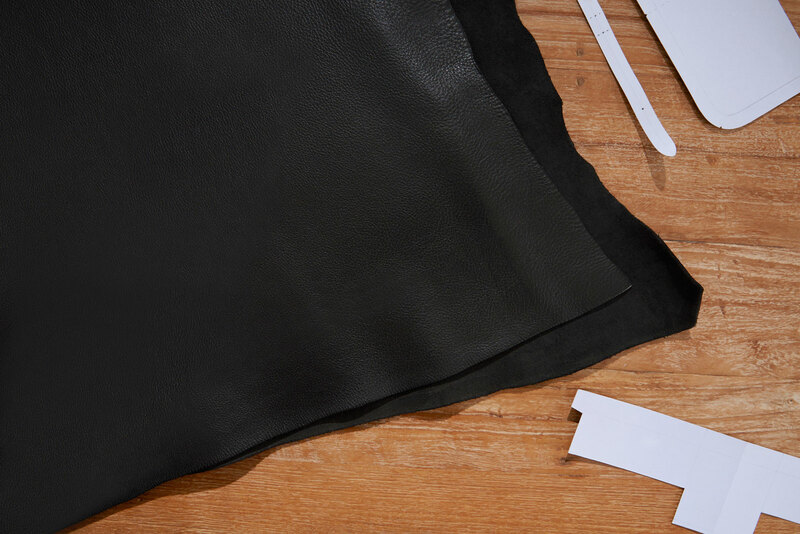 Each of our all-leather METTIQUE products is designed to age nicely, together, as a single piece. Our craftsmen are our family. We treasure their ideas, their feedback, their suggestions for new craftsmanship techniques. 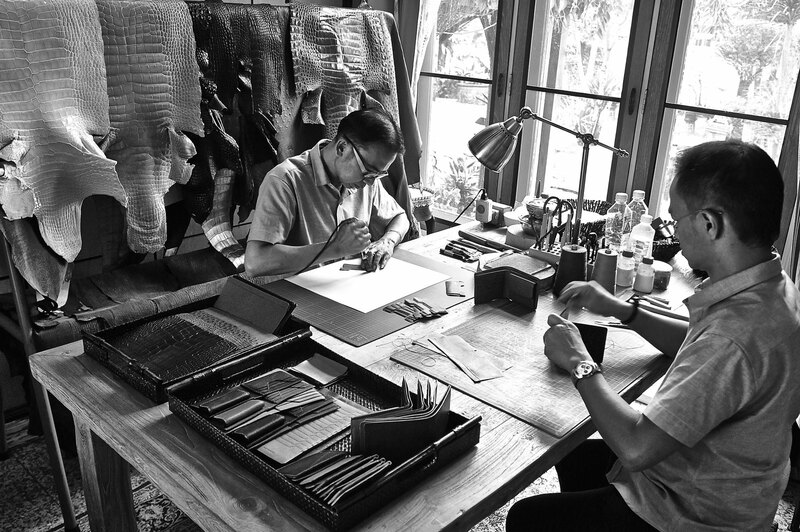 These experienced craftsmen possess true passion for leather craftsmanship. They imbue each piece they create with their expertise, their ideas, and above all, their passion. Our craftsmen are not mere manufacturers; their involvement with the products they create extends past the mere execution of a given design. They factor into the creation of existing designs, and often inspire the design and techniques used in upcoming collections. METTIQUE never outsources its productions. In this way, we ensure complete control of our production process. The techniques used to produce each METTIQUE piece are implemented exclusively by distinguished craftsmen recruited at our own atelier. 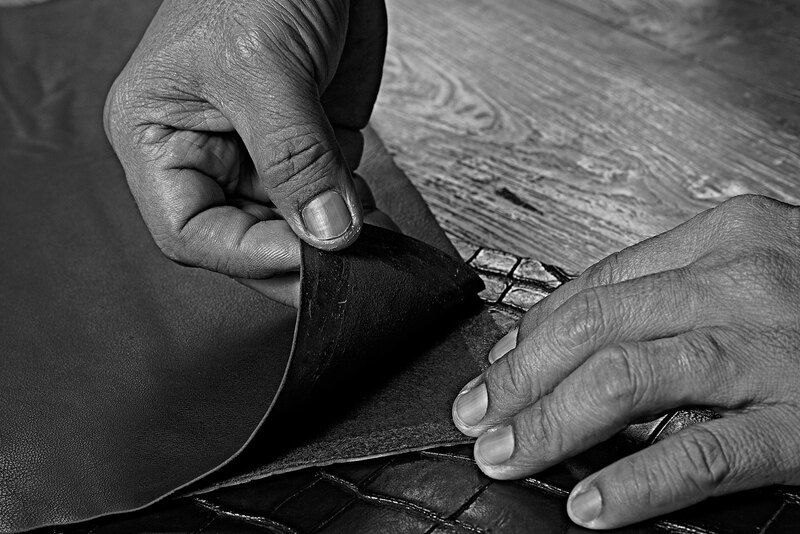 METTIQUE selects only the highest quality real-grained leather for our products. We source our skins around the world, with an eye toward choosing the only the best skins of each type, from their respective places of origin across the globe. 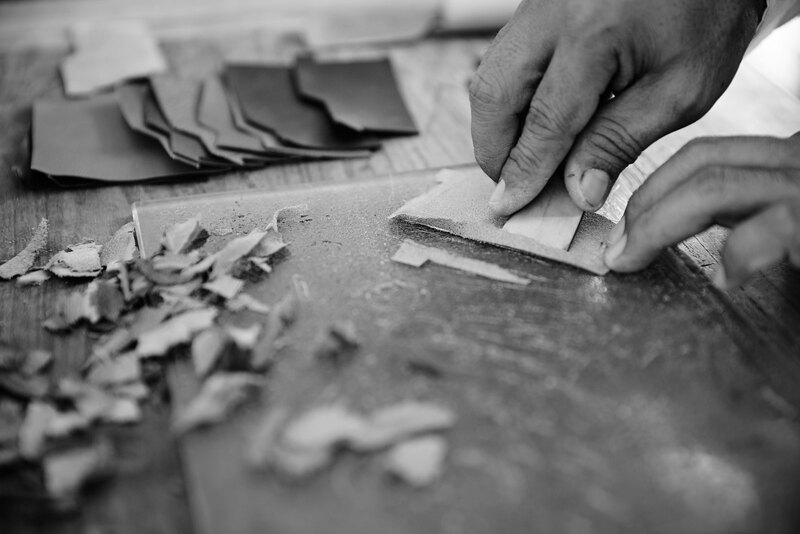 When we select the leather for each pattern part, we quality-control all imperfections on the skins. And because we only use real-grained leather, a certain measure of natural imperfections from veins, or in the form of wrinkles, is natural and desirable. We treasure such patterns. However, in leather selection there is an aesthetic balance to be struck: between finding beautiful naturally occurring patterns and separating out imperfections so large they would distract from this beauty. With this balance in mind, it is the imperfections that are too noticeable that become “defects” by our standards. Therefore, all our skins are first thoroughly inspected, to ensure that only the finest parts are used. Our team spots, marks out and rejects any “defect” on the skins that do not meet our aesthetically driven quality standard. 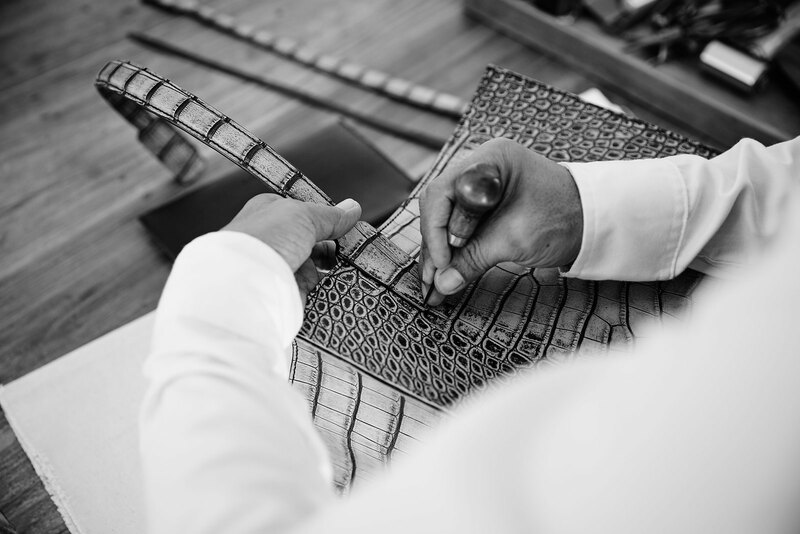 The craftsmen then select the area on the skin that is best suited for each pattern part. When we do our own tanning, we do so by means of a centuries-old artisanal technique. It’s performed exclusively by hand, with natural tannins of vegetable origin, imported from Italy. We are proud to be one of the only leather workshops in the country currently implementing a true “slow-tanning” technique. This process results in stunning finished products, whose leather will only improve with age. The wrinkles and subtle scratches that eventually emerge on slow-tanned leather, from normal use, only add to its beauty. They are a testament to its authenticity, naturalness, and of course, uniqueness; each of our natural skins is absolutely one-of-a-kind. 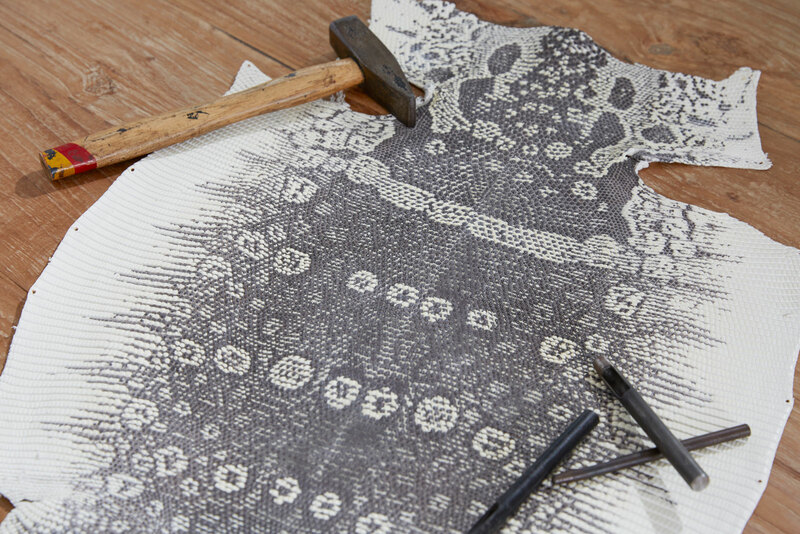 Before all patterns are made, each prospective METTIQUE piece of work is neatly hand-drafted in 3 dimensions on paper. Once finalized, our pattern makers accurately draw the patterns with the exact sizing on cardboard. The leather parts making up the final products are excised based on these cardboard patterns. The skins used for each pattern part are selected discerningly. We aim always to strike the proper balance: a uniformity and congruity of all parts, without sacrificing naturalness. We believe this is what results in a perfect end-product. Each finished METTIQUE product of course comprises various pattern parts; some products are even composed of more than fifty pattern pieces. Each pattern part requires different thicknesses. Our leather fining specialists calibrate our fining machine with an accuracy on the scale of micrometers. What distinguishes a METTIQUE piece of work from other products is that we pay attention to the smallest details. 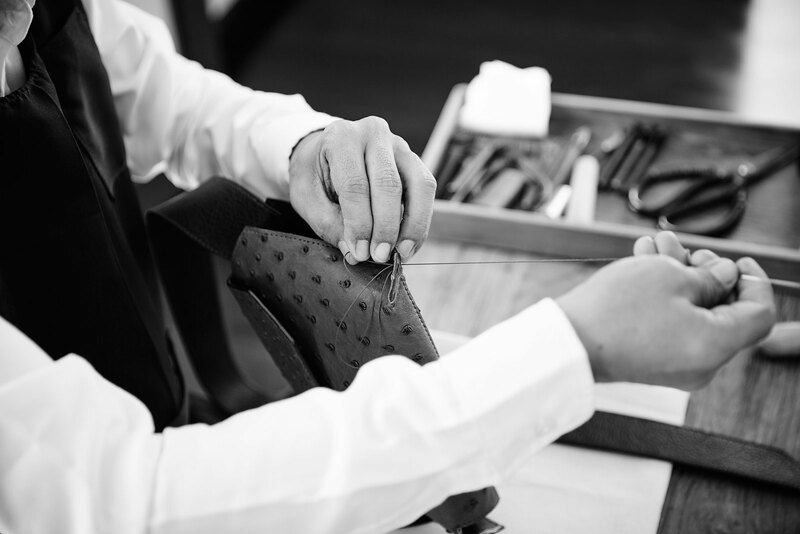 The precision crafting of distinguished pieces demands no less than master craftsmanship. We aim to hone our craft to a level of sophistication unmatched by other common ateliers. We craft some pattern parts by hand even after they have been thinned by machine. This provides us with a cutting accuracy of up to a tenth of a millimeter for pattern parts. The result is a precisely-crafted, well-proportioned final piece. Before the fined pattern pieces are stitched together, they must first be glued together. This is no simple process and is the all-important prerequisite to stitching. Only well-trained craftsmen can carry out a perfect gluing, ensuring the avoidance of excess glue that could damage the precious leather and endanger the assembly. 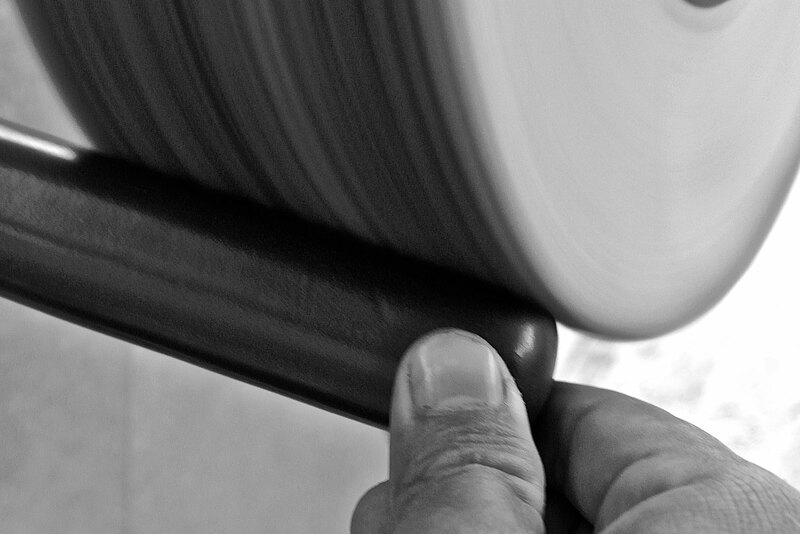 Our craftsmen perform each assembly with skill, patience, and care. 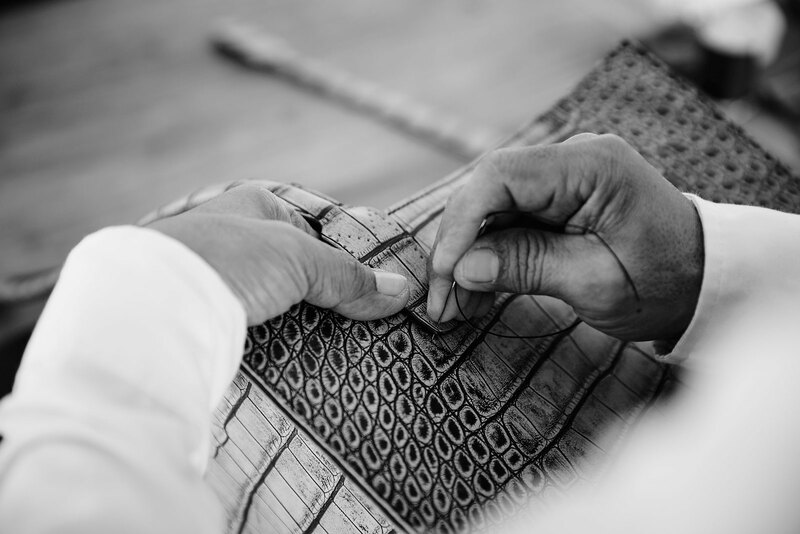 When a METTIQUE piece of work requires hand-stitching, holes are punched by our skillful craftsmen, who aim for perfect alignment every single time. Such an alignment is often overlooked in common ateliers, and this can result in flawed end-products. Proper alignment, though a detail, is the backbone of a perfect final stitching execution. We are proud to say that we are one of a couple ateliers in the country currently implementing this “non-stitching” technique. This unique technique is truly special. 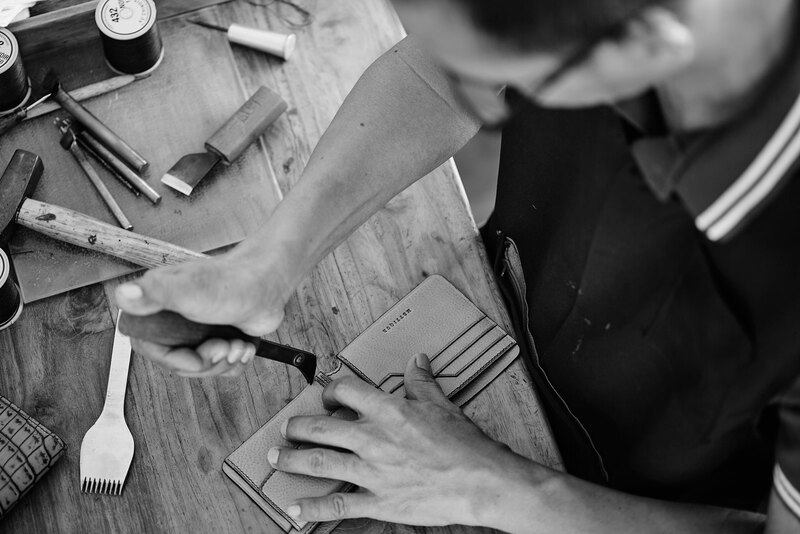 Each piece of work from the TAMZO product line requires not a single stitch. Each is precisely crafted, its pieces carefully aligned and magically “bonded,” to permanently create the distinctive products in the TAMZO Collection. 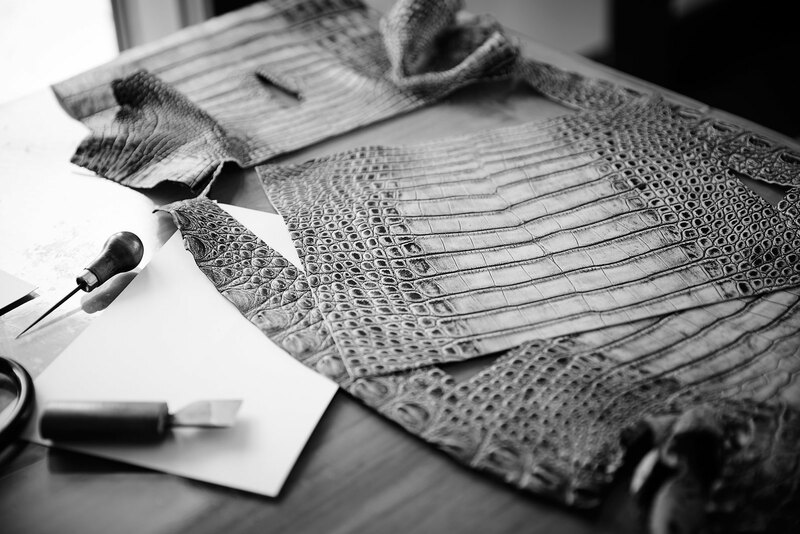 METTIQUE is a modern atelier with a love of tradition, of craftsmanship, and of artisanship. In all cases, the best techniques are those that have been passed down through the ages, sometimes perfected over centuries. Hand-stitching technique lends an organic allure to a piece, and our craftsmen are masters of the hand-stitching technique. All of our work, which incorporates 100% hand-stitching, demonstrates a palpable artistry, an artisanal refinement, a charisma all its own. All parts of each METTIQUE item are edge-polished to ensure high edge durability. 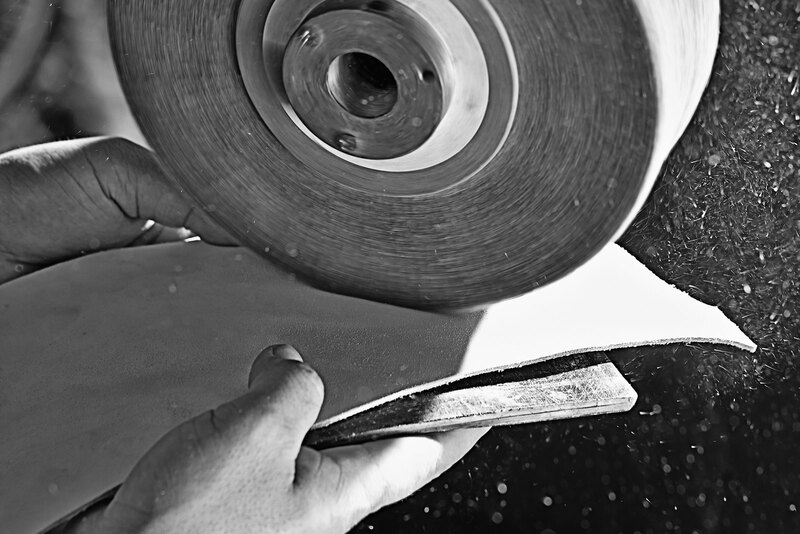 All edge polishing steps are done entriely by hand. 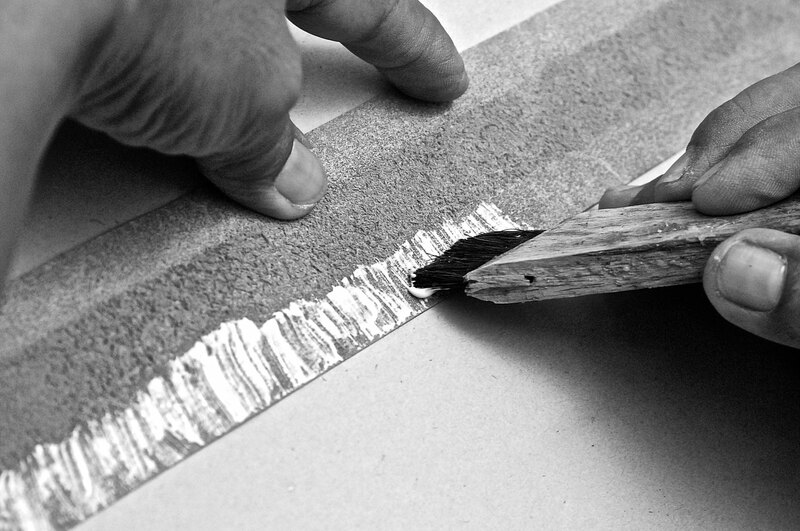 Once the edge in trimmed perfectly, the paint is then applied to the edge by hand very carefully to avoid any spills. Mettique selects only the best edge paints avaiable in the market; ours come from Italy and France only. Once the edge paint dries up, the edge is then burnished, polished and buffed. This cycle is repeated a few times over and over until the perfect edge is achieved. 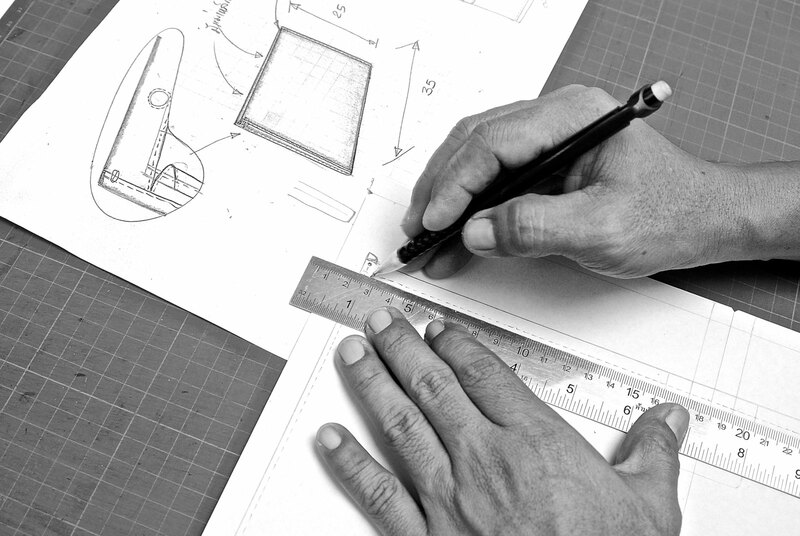 Each METTIQUE product is quality controlled, by hand, by the craftsmen who make them. Piece by piece, they uphold our premium quality standard. Wild Alligator Mississippiensis that Mettique sources come from the best tannery in Singapore. This tannery supplies the highest quality alligator and crocodile skins for most of the world’s luxury brands. 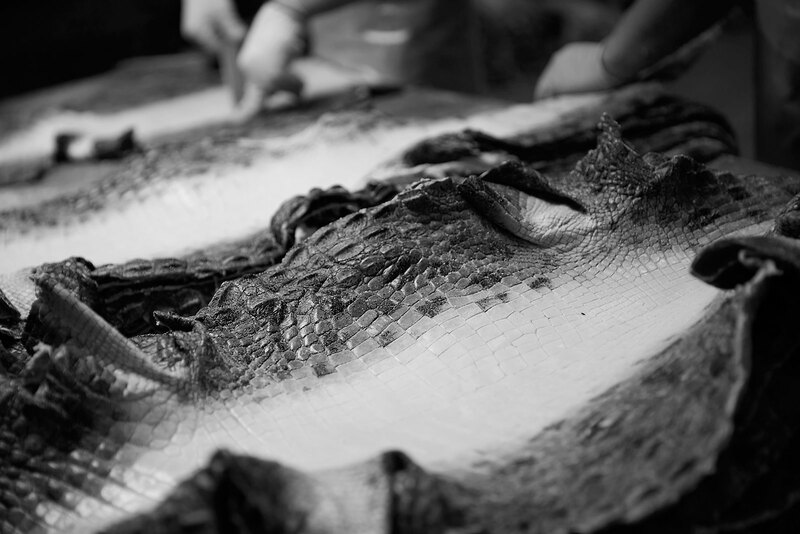 We specifically choose to work with the wild alligators, as their skins are richer than the farmed alligators. Coming from the wild in the North American continent, these skins may possess some slight imperfections and are testaments to their lives in the wild environment. 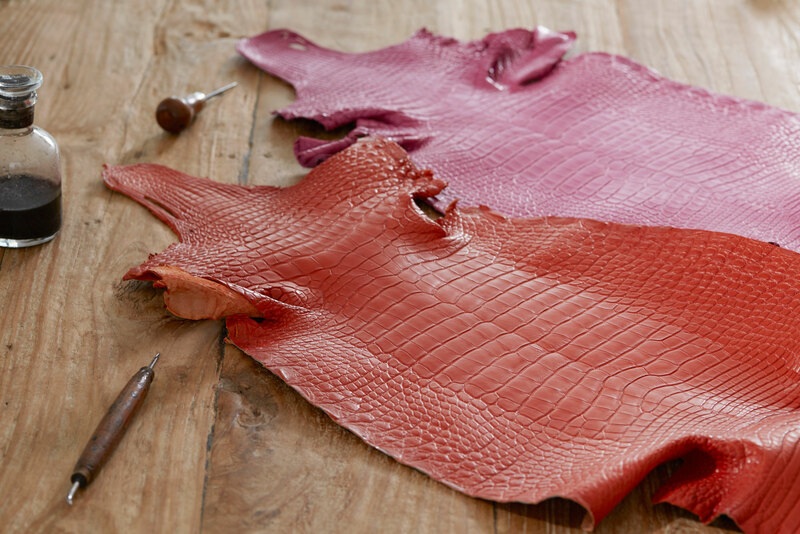 Mettique selects many types of finishing for the wild alligator skins, two of which are classics: matted and shiny, others include rubbed-off, hand-painted and sanded-off to name a few. The sturdy matted finish is more forgiving and is more water resistant. The elegant shiny finish is more delicate. Both types of finishing allow for the development of a nice patina over time. They come in many basic colors such as black and brown, as well as in an array of vivid seasonal colors. All of our alligator skins are CITES certified, which ensures that all steps and activities for hunting the animals comply with international regulations set by the Convention of International Trade in Endangered Species of Wild Fauna and Flora (CITES). Mettique selects to work with two species of crocodile; freshwater Nile crocodile (Crocodylus Niloticus), native inhabitants of Africa's Nile River in the region of Zimbabwe and saltwater crocodile (Crocodylus Porosus), native to Northern Australia and throughout Southeast Asia and possesses smaller scales. We believe that the skins of these two species are most suited for our products in many measures such as the firmness and the skin pattern. These skins are exclusively tanned in Singapore by the best tannery that supplies best luxury brands. The most distinguishing feature of crocodile skin is the integumentary sensory organ pore with a sensory hair on each scale. After the skin is tanned the hair is removed but the pore in each scale remains. 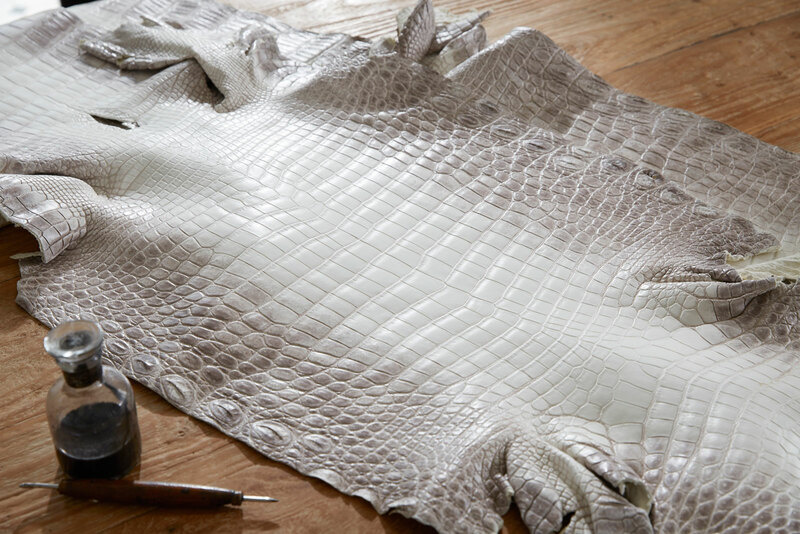 Mettique selects many types of finishing for the crocodile skins, two of which are classics: matted and shiny, others include rubbed-off, hand-painted and sand-off to name a few. The sturdy matted finish is more forgiving and is more water resistant. The elegant shiny finish is more delicate. Both types of finishing allow for the development of a nice patina over time. They come in many basic colors such as black and brown, as well as in an array of vivid seasonal colors. All of our crocodile skins are CITES certified, which ensures that all steps and activities for hunting the animals comply with international regulations set by the Convention of International Trade in Endangered Species of Wild Fauna and Flora (CITES). 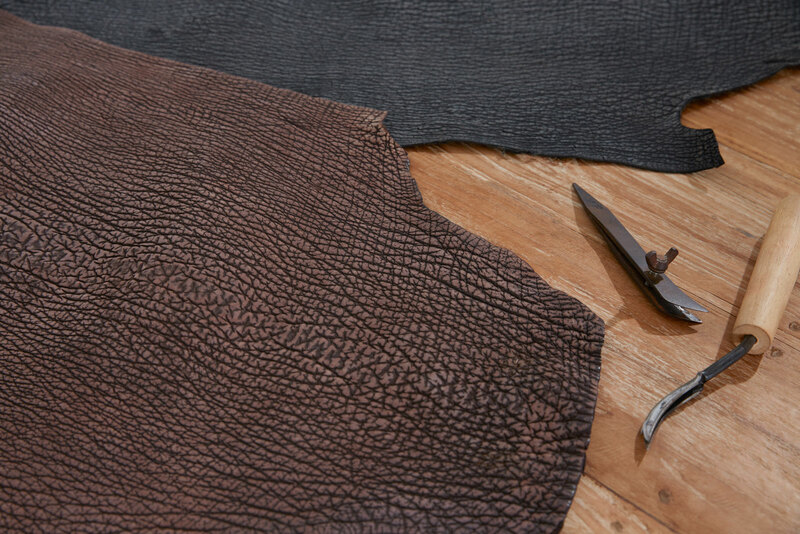 These ostrich skins, coming from one of the best tanneries in South Africa, is authentic. Well-developed quills are the result of full-grown feathers that create a follicle that is rounded and closed. Development of feather follicles is genetically determined and differs from skin to skin. We select the skins with semi-matte finishing. In time, these high quality ostrich skins allow nice patina to develop, imprinting your character on the leather—in a way that is completely based on how you look after your METTIQUE piece of work. We select only skins of Grade 1. The grading criteria are based on multiple factors including the aesthetic appeal, the quality of quills and colors, to name a few examples. All in all, you can expect the skins of Grade 1 that we use in our products to be free of defects. All the skins that we source contain The Certificate Of Origins, which allows us to trace back to the origins of the animals. 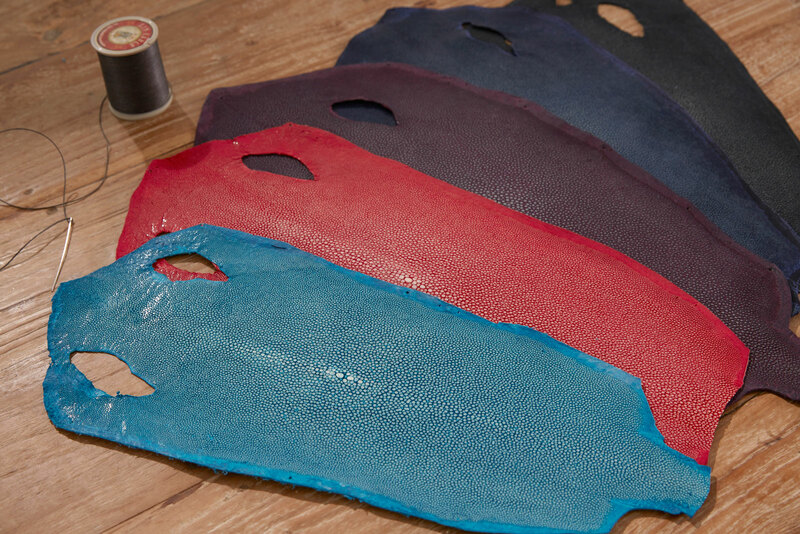 The shark skins, exclusively sourced from an Italian tannery by Mettique, come from blue shark, Prionace Glauca. These sharks inhabit the deep waters in the world's temperate and tropical oceans. They are not protected nor endangered. These skins are exceptionally sturdy and effectively waterproof. Their natural patterns are very unique and feel very arid. Because of their shape and size, these skins are suitable for smaller items. They come in solid matted and two-tone nubuck finishings and are available in a few basic colors. METTIQUE sources two species of python: Asiatic reticulated python, Python reticulatus and Burmese python, Python bivittatus. Python reticulatus is native to India and South East Asia. Reticulatus in Latin means “net-like” and refers to the complex color pattern found on the python. Python bivittatus is one of the five largest snakes in the world and is native to a large variation of tropic and subtropic areas of Southern Asia and Southeast Asia. 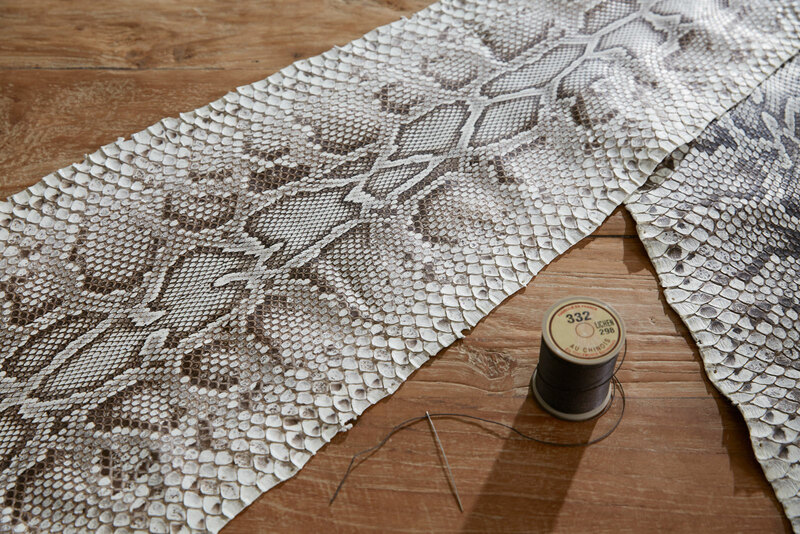 METTIQUE works with one of the best tanneries in Spain that specialize in python skins. We work with different types of finishing for the python skins which include the classic matte and shiny but also the special handpainted ones. The sturdy matted finish is more forgiving and is more water resistant. The elegant shiny finish is more delicate. Both types of finishing allow for the development of a nice patina over time. They come in many basic colors such as black and brown, as well as in an array of vivid seasonal colors. All of our python skins are CITES certified, which ensures that all steps and activities for hunting the animals comply with international regulations set by the Convention of International Trade in Endangered Species of Wild. The lizard skins that Mettique sources come from a large member of the monitor lizard family, Varanus niloticus, commonly known as Nile monitors. They are native to Africa and are distributed throughout the central and Southern regions of the continent. Mettique works with a tannery in Spain that supplies the highest quality lizard skins to world’s top luxury brands. These skins are treated with natural wax finish that will allow the development of a nice patina over time. They come in various types of finishing such as matted, shiny, nubuck and more. We select basic colors such as blue, as well as in an array of vivid seasonal colors such as metallic or two-tone. All of our lizard skins are CITES certified, which ensures that all steps and activities for hunting the animals comply with international regulations set by the Convention of International Trade in Endangered Species of Wild Fauna and Flora (CITES). These French goat skins are used by some of the most respected brands in the world and are now available at METTIQUE in a wide range of colors. The stingray skins that METTIQUE sources are sharp nose stingrays or whitespotted whipray, stemming from the Himantura gerradi species. These stingrays are not from an endangered species and do not require CITES certificate. They are found in Indo-Pacific coastal regions. The shinny defined bony crown of the stingray skin is a result of the tanning and extensive polishing processes. The idenity of stingray skins is composed of ivory. The cowhide skins come from selected few of the very best tanneries in Italy, specializing only in cow skins. We select the most precious hides, which show a very refined grain that originates directly from the animal skin structure. These selected skins have been tanned exclusively with natural tannins of vegetable origins and does not contain substances prohibited by law. Tannin extracts are a fundamental ingredient for the slow tanning process and the quality of its result. 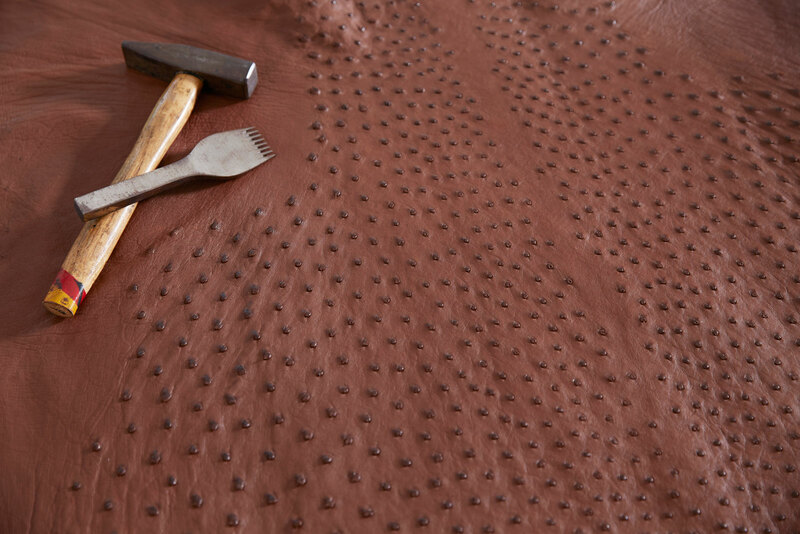 Small veins, wrinkles and imperceptible scratches eventually emerge on the leather to authenticate its naturalness, rendering each skin one- of-a-kind. Each hide therefore retains a unique and solid identity, with its own grain and pattern originating from the natural veins of the animal. The Italian Cowhide leather is available in a wide range of colors.